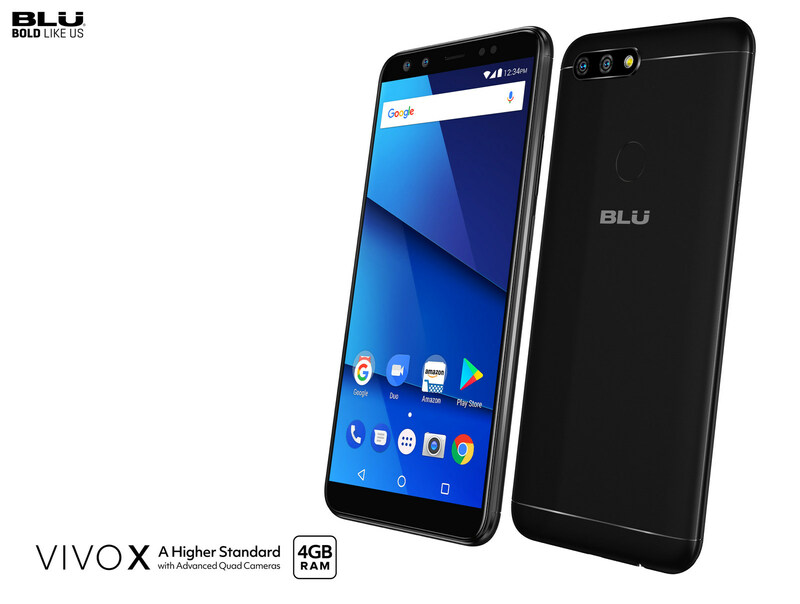 BLU Products, the market leader in unlocked devices in the United States, announced today the launch of the BLU VIVO X, its latest flagship smartphone powered by MediaTek's Helio P25 premium 2.6GHz 64-bit True Octa-core™ LTE smartphone SoC, designed for both high end flagship performance and power efficiency. The BLU VIVO X features a vivid 6.0-inch HD+ 18:9 widescreen Incell display with curved Corning Gorilla Glass, advanced quad cameras with photo enhancing editing software for superior camera performance. The VIVO X is available for $299.99 on Amazon.com, but will be available at an introductory limited time offer at $100off, so just $199.99 for the lucky initial buyers of the Vivo X. When it comes to cameras, two is better than one, and four is better than two. 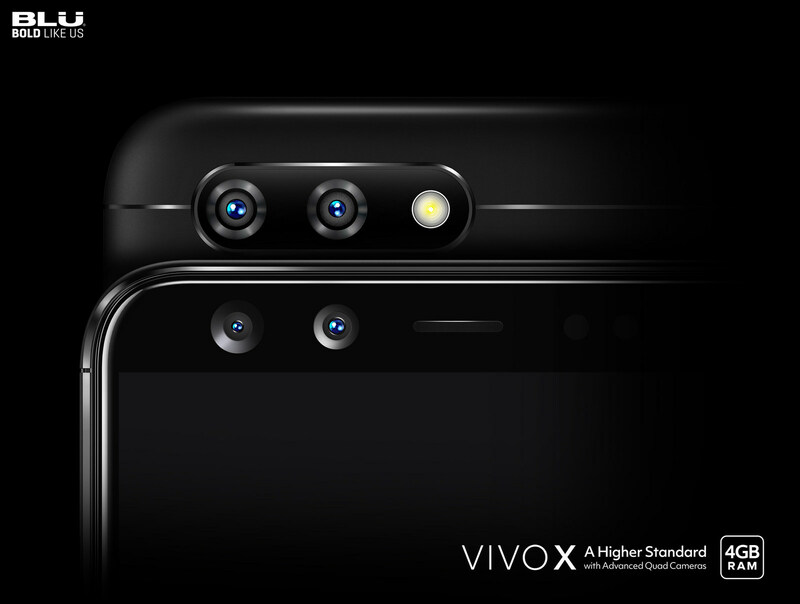 The VIVO X boasts a dual Super Selfie camera configuration with a 20 megapixel SonyIMX376 camera sensor featuring advanced technologies, F/2.0 aperture, and 1/2.8 inch sensor with 5P lens which provides more clarity and capture impeccable selfies. Paired with an 8 Megapixel 120° Wide Angle camera in order to capture exquisite selfies to make sure you don't miss any details. The dual main camera setup boasts a 13 megapixel camera sensor featuring advanced technologies, F/2.0 aperture, 1/3 inch sensor with 5P lens, real-time HDR, and Phase Detection Autofocus (PDAF) with Laser Focus for twice the focus rate and accuracy. Paired with a 5 megapixel camera that is used to capture depth of field to take the perfect picture. The BLU VIVO X's gorgeous 6.0-inch HD+ (1440 x 720) 18:9 widescreen Incell display elevates the smartphone's visual experience to a new level with stunning graphics and life-like colors that seem to jump off the screen, protected by a curved Corning Gorilla Glass 3 touch panel. The VIVO X's display provides the user with a whopping 80% screen-to-body ratio, providing a bigger canvas on your mobile phone for all your pictures, movies, and ample space for everyday tasks. In choosing the resolution the HD+ quality is balanced perfectly with customer preference for longer battery life as opposed to higher resolution displays which had minimal user experience improvement but much higher battery usage. The BLU VIVO X is powered by the 64-bit MediaTek Helio P25 chipset with 2.6GHz Octa-core processor for a seamless user experience. The smartphone blazes through multiple apps simultaneously, quickly browse the web, or just enjoy the smooth rendering of graphics for just about any game, all while maximizing power efficiency. Coupled with 4GB RAM and 64GB expandable internal memory, there is nothing the VIVO X cannot handle. The BLU VIVO X comes with a super 4,010mAh battery with an Ultra-Fast 5V/2A fast charging capability that will charge your phone to 100% in less than 120 minutes. Rest assured that scrambling to find a wall outlet to charge you phone is a thing of the past. Also, to preserve and maximize the last of the remaining battery with the Extreme Power Saving Mode which will keep only the basic functions of the phone to help you reach the finish line. The VIVO X was gorgeously designed and precisely engineered with structural integrity and aesthetic elements with a narrow bezel, perfectly placed fingerprint sensor, and an 18:9 curved glass display. Fine mirror like electrolyzed finish on the décor lines to compliment the aluminum housing for a premium grade product that is second to none. Stealth midnight black finish for an elegant look that is sure to make others envy.